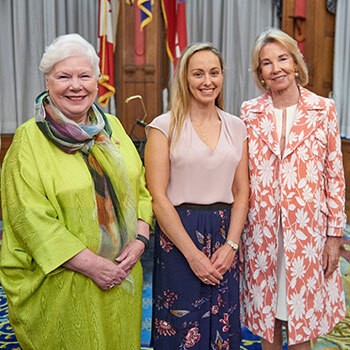 Julia Read, a doctoral student in Wilfrid Laurier University’s Lyle S. Hallman Faculty of Social Work and an addictions therapist, was presented with the Hilary M. Weston Scholarship at Queen’s Park in Toronto on Aug. 23. The scholarship, worth $7,500, is awarded annually to two graduate-level social work students with an interest in and commitment to mental health issues. The award will support Read’s research into the role of peer-support workers in mental health and addictions services, a subject she understands both personally and academically. Read ran away from a violent home as a teenager and spent 15 years of her life struggling with addiction. Three years after residential treatment, she went back to school, motivated to support those who struggled as she did. Read earned two bachelor’s degrees, in social work and in social development studies, from the University of Waterloo, and a Master of Social Work in the Indigenous field of study from Laurier before finding work as an addictions therapist at Stonehenge Therapeutic Community in Guelph. After a few years, Read returned to Laurier for her PhD to contribute to the growing research on peer support in mental health and addictions services. Now, three years into her PhD, Read is working toward a career as a professor and researcher. The Hilary M. Weston scholarship is named after former the lieutenant governor of Ontario, who was present at the ceremony alongside Laura Albanese, the Ontario minister of citizenship and immigration. Find out more about Read’s research by reading the story, "Laurier PhD student brings her own experience with addition to her research." Photo, L-R: Elizabeth Dowdeswell, Lieutenant Governor of Ontario; Julia Read; Hilary Weston.